Oil, corruption and public money. Nothing at all to do with dogs, or with integrity if it comes to that! Here are some of the things I love: my family and friends, salt marshes, arguments, chalk streams, Russian literature, kayaking among dolphins, diversity of all kinds, rockpools, heritage apples, woods, fishing, swimming in the sea, gazpacho, ponds and ditches, growing vegetables, insects, pruning, forgotten corners, fossils, goldfinches, etymology, Bill Hicks, ruins, Shakespeare, landscape history, palaeoecology, Gavin and Stacey and Father Ted. Here are some of the things I try to fight: undemocratic power, corruption, deception of the public, environmental destruction, injustice, inequality and the misallocation of resources, waste, denial, the libertarianism which grants freedom to the powerful at the expense of the powerless, undisclosed interests, complacency. 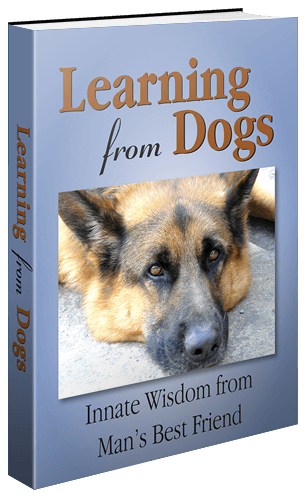 Way back in the early days of Learning from Dogs, the blog that is, not the book, George was very gracious in giving me blanket permission to republish his posts, and many of them have appeared in this place. So now read George Monbiot’s latest Rigging the Market. It is yet another example of what is going wrong in these times. Instead of a collapse in the supply of oil, we confront the opposite crisis: we’re drowning in the stuff. The reasons for the price crash – an astonishing slide from $115 a barrel to $30 over the past 20 months – are complex: among them are weaker demand in China and a strong dollar. But an analysis by the World Bank finds that changes in supply have been a much greater factor than changes in demand. Oil production has almost doubled in Iraq, as well as in the US. Saudi Arabia has opened its taps, to try to destroy the competition and sustain its market share: a strategy that some peak oil advocates once argued was impossible. The outcomes are mixed. Cheaper oil means that more will be burnt, accelerating climate breakdown. But it also means less investment in future production. Already, $380 billion that was to have been ploughed into oil and gas fields has been held back. The first places to be spared are those in which extraction is most difficult or hazardous. 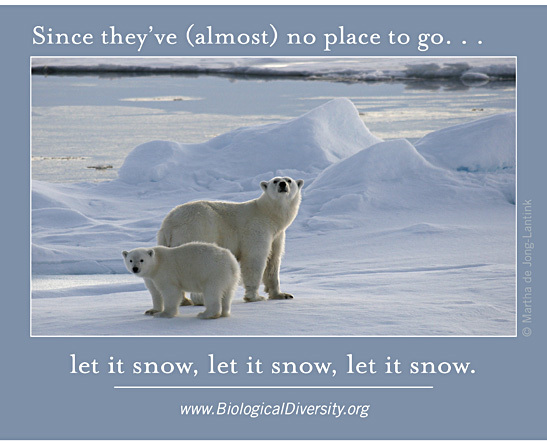 Fragile ecosystems in the Arctic, in rainforests, in remote and stormy seas, have been granted a stay of execution. BP reported a massive loss on Tuesday, partly because of low prices. A falling oil price drags down the price of gas, exposing coal mining companies to the risk of bankruptcy: good riddance to them. But some renewables firms are being tanked by the same forces: just as natural gas prices plunge, governments like the UK’s are stripping them of their subsidies. One day they will compete unaided, but not yet. To cheer or lament these vicissitudes is pointless. They are chance events that counteract each other, and will at some point be reversed. The oil age, that threatens the conditions sustaining life on Earth, will come to an end through political, not economic, change. But the politics, for now, are against us. Already, according to the IMF, more money is spent, directly and indirectly, on subsidising fossil fuels than on funding health services. The G20 countries alone spend over three times as much public money on oil, gas and coal than the whole world does on renewable energy. In 2014, subsidies for fossil fuel production in the UK reached £5 billion. Enough? Oh no. While essential public services are being massacred through want of funds, last year the government announced a further £1.3 billion in tax breaks for oil companies in the North Sea. Much of this money went to companies based overseas. They must think we’re mad. Last week, David Cameron flew to Aberdeen, where he announced another £250 million of funding for, er, free enterprise, much (though not all) of which will be used to prop up oil and gas. A further £20 million of public money will be spent on seismic testing. Expect more whale strandings, and ask yourself why the industry that threatens our prosperity shouldn’t cover its own bloody costs. The energy secretary, Amber Rudd, says she stands “100% behind” this “fantastic industry”. She will “build a bridge to the future for UK oil and gas”. Had she been born 300 years ago, I expect she would have said the same about the slave trade. In a few years’ time, her observations will look about as pertinent and about as ethical. Oil companies have already been granted “ministerial buddies” to “improve access to government” – as if they didn’t have enough already. Now they get an “oil and gas ambassador”, and a new ministerial group, to “reiterate the UK Government’s commitment to supporting the oil and gas industry”. A leaked letter shows that Amber Rudd and other ministers want to silence local people, by transferring the power to decide whether fracking happens from elected councils to an unelected commission. Let’s sack the electorate and appoint a new one. Compare all this to the government’s treatment of renewables. Local people have been given special new powers to stop onshore windfarms from being built. To the renewables companies Amber Rudd says this, “We need to work towards a market where success is driven by your ability to compete in a market, not by your ability to lobby government”. Strangely, the same rules do not apply to the oil companies. Your friends get protection. The free market is reserved for enemies. Yes, I do mean enemies. An energy transition threatens the kind of people who attend the Conservative party’s fundraising balls. It corrodes the income of old school friends and weekend guests. For all the talk of enterprise, old money still nurtures its lively hatred of new money, and those who control the public purse use it to protect the incumbents from the parvenus. As they did for the bankers, our political leaders ensure that everyone must pay the costs imposed by the fossil fuel companies – except the fossil fuel companies. 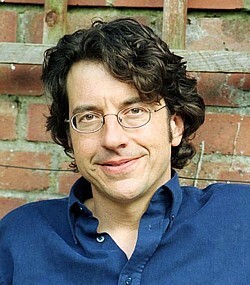 I don’t know about you but I take the view that this essay from Monbiot is to be embraced. Simply because the more that stuff like this is aired, discussed and shared then the more likely that we ordinary folk can make a social and a political difference. Give me the integrity of a dog anytime! The awareness of the vulnerability of mankind is growing apace. Last Thursday, I wrote a piece called The year of separation. Icebergs calved from Jakobshavn Glacier float to sea near Illulissat. This glacier dumps more ice into the global ocean than any other glacier in the Northern Hemisphere, and is thus Greenland’s single biggest contributor to the global sea level rise of one-eight inch per year. When researching material for that article, I came across the official trailer for the film Chasing Ice. The fact that this film is being shown in cinemas and movie theaters across the world is highly relevant. Because it demonstrates that there is a public appetite for such a film otherwise it would never had made it as a film project. But not only that, read some of the reviews mentioned on the Chasing Ice website. Jeff Orlowski’s documentary begins as a straightforward biographical profile, before shifting up into something more urgent, impassioned and compelling. Its subject, James Balog, is a photographer who goes to extremes to prove the existence of global warming: his latest expedition involves descending Arctic cliff faces to fit time-lapse cameras with which to monitor glacial erosion. If any film can convert the climate-change sceptics, Chasing Ice would be it: here, seeing really is believing. Jeff Orlowski’s first-rate documentary begins with complacently smug anti-global-warming clips from Fox News and from the owner of America’s weather channel. 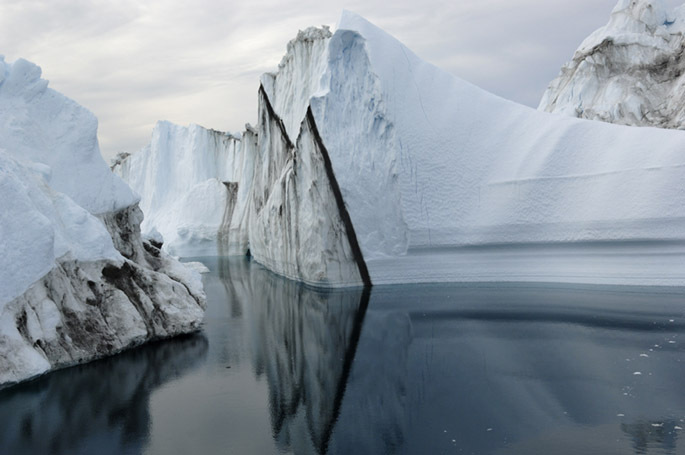 It then introduces the persuasive environmentalist James Balog, a celebrated photographer working for National Geographic, who became fascinated with what glaciers can teach us about our changing planet. In 2007 he set up the Extreme Ice Survey (EIS), a well-funded project to monitor glaciers in Greenland, Iceland, Montana, the Alps, Canada and Bolivia, and the results – photographed using state-of-the-art time-lapse cameras – are sensational in their beauty, terror and the irrefutable evidence they provide of the rapidity with which age-old ice packs are melting away. It’s like watching our world disappear. “Chasing Ice” aims to accomplish, with pictures, what all the hot air that has been generated on the subject of global warming hasn’t been able to do: make a difference. The documentary by Jeff Orlowski follows nature photographer James Balog as he documents melting glaciers, beginning in 2007, in Alaska, Iceland, Greenland and Montana. Called the Extreme Ice Survey, the project works like this: Balog sets up still cameras that have been programmed to take a picture, once every hour, for three years, of the same glacier from a fixed spot. “Chasing Ice” will make an impact, that’s for sure. Whether it can be said to have been effective remains to be seen. This portrait of a man on a mission moves us, not by showing us what we’ve already lost, but what’s still at stake. My final dip into the review pot is from America Magazine – The National Catholic Review. So you get the message! Here’s that film trailer. And make a note to go to the website of the Extreme Ice Survey and ponder on what you can do to make a difference. That’s the broad ‘you’ by the way. The one that includes you and me and all those on this planet that want to make a difference. The dreaded ‘A’ word – Alzheimer. Science may just be starting to make some sense of this cruelest of diseases. It used be to the dreaded ‘C’ word; cancer. But now that ‘C’ word has a companion, the dreaded ‘A’ word. The incidence of Alzheimer’s disease seems to be on a terrible rise. Indeed, my wife, Jean, lost her late husband to Alzheimer’s disease. My half-sister back in England is now very ill with the disease. Just chatting to some people here in Payson a few days ago revealed many who had friends or relations suffering. So a recent item first seen on the website of The Permaculture Research Institute of Australia really jumped off the ‘page’! It was an article by George Monbiot entitled The Mind Thieves. I dropped Mr. Monbiot a quick email requesting permission to republish the article and very promptly received a positive answer. Thank you, Sir. Here are some of the things I love: my family and friends, salt marshes, arguments, chalk streams, Russian literature, kayaking among dolphins, diversity of all kinds, rockpools, heritage apples, woods, fishing, swimming in the sea, gazpacho, sprinting up the pitch in ultimate frisbee, ponds and ditches, growing vegetables, insects, pruning, forgotten corners, fossils, goldfinches, etymology, Bill Hicks, ruins, Shakespeare, landscape history, palaeoecology and Father Ted. The article was first published in the British Guardian newspaper (there’s an online link to it here) as the article mentions below. But I am republishing, in full thanks to George, the copy that appeared on George’s website on the 10th September last, including the references. 12. Eric Steen et al, 2005. Impaired insulin and insulin-like growth factor expression and signaling mechanisms in Alzheimer’s disease – is this type 3 diabetes?. Journal of Alzheimer’s Disease, Vol. 7, pp.63–80. Don’t know about you but the above is a fine example of investigative reporting. It deserves the widest circulation because if it is proved that there is a link between diet and Alzheimer’s disease then, once again, it shows how taking personal responsibility for our health has huge implications for us, our families and for society at large. What’s the weather like, honey? A couple of articles about our weather prospects. Let me start with a recent report from Environmental Research Web, part of IOP Publishing. Rising sea levels will increase the vulnerability of coastal areas, and the increase in “extreme weather events” will wipe billions off national economies and destroy lives, according to the Intergovernmental Panel on Climate Change (IPCC), the body of the world’s leading climate scientists convened by the United Nations. Now I turn to last week’s Economist newspaper. IN HARD times governments are consumed by short-term problems. But this does not mean the archetypal long-term problem, climate change, has gone away. Science continues to support the case for curbing greenhouse-gas emissions so as to minimise the risks of catastrophe. Meanwhile it is clear how wretchedly the world is failing to do so. Even if countries honour their promises, the UN reckons that by 2020 emissions will exceed the trajectory for keeping warming under 2°C by up to 11 gigatonnes. That is equivalent to more than double the emissions of every car, bus and truck in 2005. No one should imagine such a deal would turn the tide on climate change. That tide will rise, and countries will need to adapt to a lot of warming. But by acknowledging that everybody has a responsibility to act, it would represent progress. The good news? While 2010 tied for the warmest year on record, 2011 — according to the U.N.’s World Meteorological Organization (WMO) — is likely to come in 10th once November and December temperatures are tallied. In part, this is evidently due to an especially strong La Niña cooling event in the Pacific. On the other hand, with 2011 in the top ten despite La Niña, 13 of the warmest years since such record-keeping began have occurred in the last 15 years. Think of that as an uncomfortably hot cluster. More love in many forms. A fascinating and beautiful insight into wild turkeys! Yesterday, I published a couple of stories that demonstrated that close, loving bonds can form between different species, including an orang-utan and a dog, and a duck and a man. By chance, Jean and I came across another example of cross-species bonding. This time between Joe Hutto, an American living in Florida, and a brood (is that the right description?) of newly-born wild turkeys. The first thing these tiny birds saw when they opened their eyes after breaking clear of their egg was Joe, and they immediately imprinted him as their ‘mother’. Joe spent a complete year and more being ‘mother’ to these birds right up to the point where they naturally flew the nest, so to speak. Joe’s experiences led to a book, Illumination in the Flatwoods, and from that to a BBC Natural World special My Life as a Turkey, regrettably not available to viewers outside the UK. Joe Hutto’s life changed when a local farmer in the Florida flatlands where he lives left a stainless steel dog bowl full of wild turkey eggs on the porch of his cabin. Joe put them in an incubator, and waited. Some weeks later, cracks began to appear. This is the crucial time: “imprinting” only occurs in the first few moments after hatching. So Joe put his face down to the level of the opening eggs and the first poult emerged, wet and confused. Joe made a chirping, clucky noise, the poult looked him square in the eye, “and something very unambiguous happened in that moment”. The little turkey stumbled and crawled across to Joe, and huddled up against his face. It recognised Joe as its mother. In the next few hours, Joe became mother to 15 more baby turkeys and remained so for the next 18 months. My Life as a Turkey: Natural World Special (BBC2) tells that story. For a whole year his turkey children were his only companions as he walked them deep through the Florida Everglades. Suffering all the heartache and joy of any other parent as he tried to bring up his new family, he even learnt to speak their language and began to see the world through turkey eyes. Told as a drama documentary with an actor recreating the remarkable scenes of Joe’s life as a turkey mum. 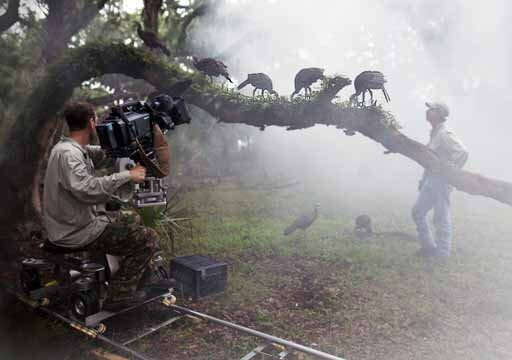 Behind the scenes image of turkeys and Jeff Palmer (actor) in misty forest in Florida. Cameraman (Mark Smith) on track & dolly shows how some of the beautiful sweeping shots were filmed. It’s not hard to see how the little birds were taken in. Joe’s moustache does look a bit like feathers, he has a long scraggy neck, an understanding of the forest, and a tentative, birdlike walk. He takes them out, to catch their first grasshoppers; he teaches them how to roost. For Joe, as for any mother, parenthood is an emotional rollercoaster ride. There is the joy of seeing his babies grow, but almost constant worry. Grief too, when one is taken by a rat snake, and another by a hawk, and two more get sick (bird flu?) and die. Adolescence arrives with all its associated problems. The males start fighting; only the toughest will get to mate. “I had no way of knowing how I was going to be part of this rite of passage,” says Joe. Steady now, Joe, let’s not take this too far, you’re not supposed to mate with any of them. For one, they’re your children. They’re also turkeys. That would be doubly wrong. Sometimes I think Joe spends too much time alone in the forest. 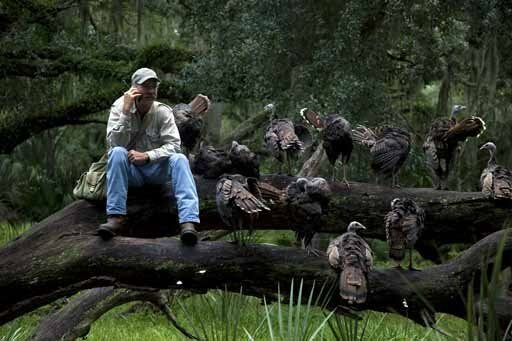 Jeff Palmer (actor) sat on large felled tree on his cell phone with a dozen wild turkeys. My Life as a Turkey isn’t simply a wildlife film though. It’s not just about wild animals, it’s about one man’s relationship with wild animals, and that’s what makes it so fabulous. Serious animal behaviourists may not agree, but if you throw a human being in there, it all suddenly becomes a lot more interesting. I’m thinking Ring of Bright Water, Gorillas in the Mist, I’m definitely thinking Werner Herzog’s brilliant Grizzly Man about a man named Tim whose friendship with bears went wrong and he ended up inside one. My Life as a Turkey has something of Grizzly Man about it – a man obsessed, alone in a beautiful place, living with wild animals. But, although Joe was attacked, he didn’t end up inside one of his turkeys thankfully. There would have been a certain irony to that, especially if it had happened at Thanksgiving. Anyway, it’s a lovely film – beautiful, charming, funny, sad, thought-provoking even. What thoughts did it provoke in me? That I need to go and see my mum. Unfortunately, as mentioned above if you are outside the UK you are not able to watch the film via the BBC iPlayer system. But you can buy the book. Joe Hutto's book of his life with wild turkeys. 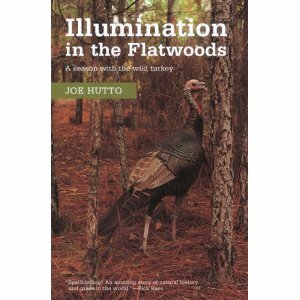 My review is not unbiased because Joe Hutto, author of “Illumination in the Flatwoods,” and I have been friends for almost 25 years. Joe is the most humble man I’ve ever known. I am honored that he brought me the original manuscript to read. It was so beautiful I could have cried. With the same graceful writing skills used by conservationists Aldo Leopold (“Sand County Almanac”) and Herbert Stoddard (“Memoirs of a Naturalist”), Joe gives a masterful mix of documentary-style nature reporting and heartfelt thoughts on the meaning of life. As dramatic as that sounds, I think most readers will agree that “Illumination in the Flatwoods” is a life-changing book. You will never regret the dollars you spend to buy this book nor the time it takes you to read it. . .
Just a few recent items to underline what a strange species we are! This is being written on the 8th, not too many hours after the successful launch of the very last Shuttle space flight. Forget the [valid] question of cost, this launch sufficiently inspired nearly a million people to travel to the Kennedy Space Center to watch this historic flight. That adventuring drive is a wonderful aspect of mankind. Now to another view of mankind. Washington’s Blog of the 3rd July, 2011 has an in-depth review of how “the Japanese government, other governments and nuclear companies have covered up the extent of the Fukushima crisis.” In that excellent piece, there is a reference to material in the British Guardian newspaper (I’m taking the liberty of re-publishing quite a long extract from Washington’s Blog). It’s us, all of us, that create the systems, the political and government systems that are at the heart of this approach to life. But it’s also us, all of us, that ‘write’ such beautiful stories as this one from NPR Music. Paul Simon has brought joy to so many for so long, but on this night he made Rayna Ford’s dream come true. During a show in Toronto on May 7, Rayna Ford, a fan from Newfoundland, called out for Simon to play “Duncan,” and said something to the effect that she learned to play guitar on the song. In a moment of astonishment and disbelief, Paul Simon invited her on stage, handed her a guitar and asked her to play it for the crowd. When she strapped on the guitar, the audience went crazy. In a few strums, the band played along, tears ran down Rayna Ford’s cheeks and Simon stood by her side in smiles. What a strange lot we are!